Up to this point, the verses have mostly been giving introduction. But now Nephi starts giving us the context of his situation–his backstory, if you will. 609 BC: Jerusalem becomes part of the Empire of the Twenty-sixth dynasty of Egypt after Josiah of Judah is killed by the army of Pharaoh Necho II at the Battle of Megiddo. Josiah’s son Jehoahaz of Judah is deposed by the Egyptians and replaced as ruler of Jerusalem by his brother Jehoiakim. 605 BC: Jerusalem switches its tributary allegiance back to the Neo-Babylonians after Necho II is defeated by Nebuchadnezzar II at the Battle of Carchemish. In a sense, Zedekiah was Judah’s last chance to prove that Jerusalem could handle governing itself. Nebuchadnezzar was watching Jerusalem close, ready to strike if it rebelled against him. Even more important, the Lord was giving His people one last chance to prove that they were willing to obey His laws and heed the counsel of His prophets. The king and the people had become so rebellious against the Lord that even when God counseled them to avoid an alliance with Egypt and side with Babylon (with whom Jerusalem already had an alliance, and had been paying tribute), they wouldn’t listen. Even the priests of Israel had adopted many of the wicked practices of the surrounding nations and defiled the Lord’s temple. When it came down to it, the children of Israel had lost sufficient faith in the Lord to follow His counsel, and even despised the prophets He sent. 11 ¶Zedekiah was one and twenty years old when he began to reign, and reigned eleven years in Jerusalem. 14 ¶Moreover all the chief of the priests, and the people, transgressed very much after all the abominations of the heathen; and polluted the house of the Lord which he had hallowed in Jerusalem. Zedekiah’s fall marked the end of the rule of Judah, meaning that once he was taken, the Jews would not govern Jerusalem again until modern times. Who were the other prophets that testified against Jerusalem? The fact that the bible doesn’t mention Lehi suggests that there were probably several prophets now unknown to history that testified against Jerusalem, but the bible does mention a few. Some were before Lehi’s time, others after (those who called either the remaining survivors, or those taken away to Babylon, to repentance), but only a couple were known to be operating in full ministry when Lehi received his prophetic call. 9 ¶Shall I not visit them for these things? saith the Lord: shall not my soul be avenged on such a nation as this? 11 And I will make Jerusalem heaps, and a den of dragons; and I will make the cities of Judah desolate, without an inhabitant. and Daniel 3)Daniel’s ministry seems to begin at the time of his being carried away into Babylon. A great deal of Daniel’s prophecies deal with the last days, and the coming forth of the gospel when God’s kingdom would fill the earth. Prophet’s just prior to Lehi’s time, some of whom may have known Lehi, included Joel (about 620 BC), Habakkuk (about 630 BC), Zephaniah (630 BC), and Nahum (640 BC). Their Old Testament books reflect much of the concern that the prophet’s held for Israel, and the pending destruction of Jerusalem. There were several other prophets earlier than this that also warned the people to return to the Lord, or Israel would be scattered over the face of the earth, such as Isaiah (745-685 BC), Micah (740-700 BC), and Amos (767-753). 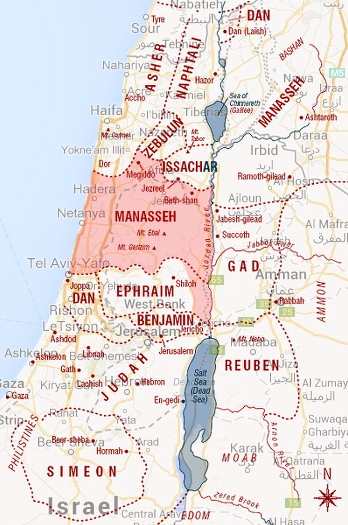 Inheritance of Manasseh, superimposed over a modern map. 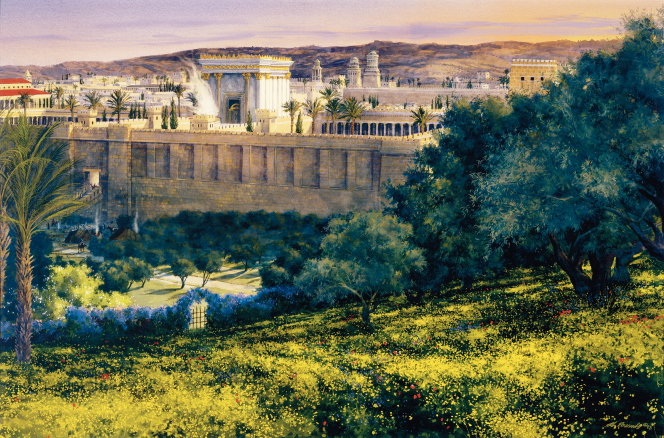 Most likely, Lehi didn’t live right in the middle of the city of Jerusalem. Nephi’s record was written 30+ years after leaving his home in the middle east. Likely, everything in that region of the world would be referred to as Jerusalem, much as a person visiting another country might refer to the cities of West Valley, Sandy, and West Jordon as Salt Lake City. Though we don’t know for certain his home town, we do know that the tribe of Manasseh (from which Lehi was born) inherited the land north of Jerusalem. It’s possible Lehi’s inheritance was in that area. 3. ↑ Daniel’s ministry seems to begin at the time of his being carried away into Babylon. A great deal of Daniel’s prophecies deal with the last days, and the coming forth of the gospel when God’s kingdom would fill the earth. This entry was posted in Book of Mormon: Verse By Verse Commentary, Nephi, Old Testament. Bookmark the permalink.